As a non-profit organization, the String Academy of Wisconsin relies on the strong and continued support of small businesses, corporations, foundations, city, state, and federal programs and grants, and not least of all, individual giving. It is with this generous support that we are able to keep our many programs running, from providing instruments to families in need to our Urban Outreach program that allows the String Academy to include many families that might otherwise be unable to provide such a high-quality level of musical education. 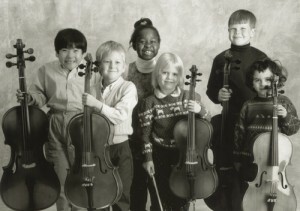 In fact, all students enrolled in the String Academy can benefit from your donation. Each student’s tuition is to some degree subsidized by our supporters – a concept that stems from our philosophy that music should be an essential component of every child’s education. We believe that a quality musical education should be made accessible to every family, regardless of ability to pay. So please consider giving generously. We have made it simple for you to give online through the link provide below. If you would like to discuss a larger gift or perhaps starting a named memorial scholarship fund, please contact Director Darcy Drexler. Your gift is tax-deductible, and you will be supporting one of the finest, most vibrant, active, and accomplished arts organizations in the country. Whether your gift is large or small, every amount is greatly appreciated and well placed. If you would like to contact us for more information about a donation, please contact us.